Its a 6 letter word. First 3 Letter indicate biggest thing in world. 1. first 3 letter indicate biggest thing in world. 2. 2, 3, 4 letter indicate parts of human body. 3. 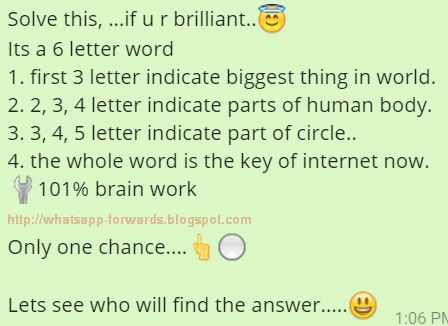 3, 4, 5 letter indicate part of circle..
4. the whole word is the key of internet now.